Everyone has different opinions about the refugee crisis and the level of involvement we should have as a country in welcoming individuals fleeing their homes in search of refuge. 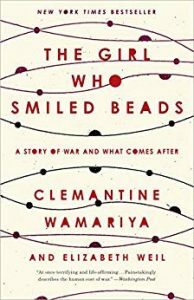 No matter your stance on this issue, the book The Girl Who Smiled Beads provides a unique story of the experience a young girl living in Rwanda had as war started to ravage her homeland. Copies of this book are available. Please email or call Laura Guenther at glguenther18@gmail.com or call / text 717-713-5863 to request a book.